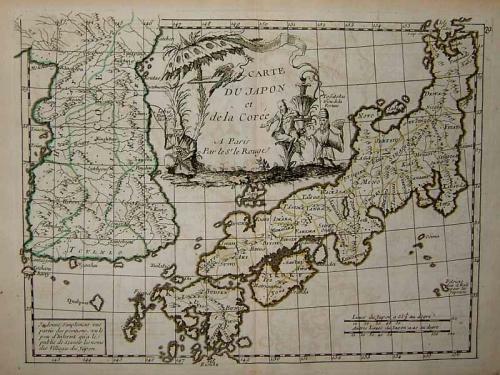 Title: 'Carte Du Japon et de la Coree'. This Map was published in 1746 in " introduction a la geographie, par le Sieur le Rouge ingeneer and geographe by Louis XV. Beautifully engraved with a very confident hand .Is decorated with a highly detailed vignette. Very bold strikes with a strong plate impressions. Any counterproofing ( image transference ) is very faint. Faint vertical fold as issued.